Where and how we live is perhaps the most basic question we can ask in our society. So for the next few weeks let's take a look at housing in our state's largest city, starting with a glimpse of Newark's 17th and 18th century homes. Although Newark's history stretches as far back as almost any American city's, and many of its earliest buildings have been razed, examples of the city's earliest homes can still be found. In the 19th century we found great country estates along the Passaic, townhouses on Broad Street and industrial slums along the Morris Canal and on the hill in 'Germantown'. Victorian castles and Italian gingerbread palaces were also part of that era. From the 20 planned communities or developments emerged the exclusive Forest Hill and later the Weequahic section. Fires regularly burned down wooden tenements clustered in the factory districts, which eventually led to federally subsidized public housing. The public housing concept was gradually abandoned starting with the implosion of the St. Louis projects in the mid-1960s and their gradual replacement with townhouse or rowhouse concept of low-rise, self-policed, and individually owned homes. As our city enters its 333rd year and we prepare for the already overused phrase of 'the next millennium,' we now are basing our hopes for the rebirth of our city on the triumph of the individual over the institution. Newark's 17th century 'master plan' called for a great north-south Broad Street intersected by an east-west Market Street. Two streets, today's Washington and Mulberry, paralleled Broad Street with its two great parks or commons. From the original settlers' maps there were approximately 40 home lots or homesteads, each approximately an acre. Upon the settlers' arrival in 1666, the original homes, according to historian John Cunningham were not much more than crude huts or caves, created to protect the first inhabitants from the coming winter. These first shelters quickly gave way to more substantial buildings. Soon Newark began to look like the typical New England towns from which the settlers originated. Broad Street came into its own by the 1750s. With two imposing colonial churches, one Presbyterian and the other Church of England, and with its huge overhanging elm trees and flowering roses, the street was an impressive sight. Gradually, as Newark became the City of Newark in 1836, spaces between the original home lots began to fill, giving the appearance of a city rather than a rural village. For proof, look at the Barber and Howe view of Newark along Broad and Market streets in the 1830s. Newark, in all directions, was taking on the appearance of a Boston, Manhattan, or Charleston, rather than a New Milford, Branford, or Guilford. So let's take a ride on an imaginary time machine and look at a group of 17th and 18th century dwellings that were important in early Newark. In the following weeks we will do the same with succeeding centuries. In 1907 a Meeker family reunion brought back family from across the land, including an Ezra Meeker, who had recently driven a team of oxen along the Oregon Trail, and a Dr. Louis Meeker or Brooklyn, whose speech detailed the family's long history. Unfortunately, the rambling old south Newark farmhouse fell to developers before World War I, when its last inhabitant and direct Meeker descendant William Grumman felt unable to 'stem the real estate development' in the neighborhood. Another 17th century structure was Johnson's Mill and Farmhouse. It was located along Bound Creek near Two Mile Brook and was built circa 1689. Thomas Johnson was one of the first settlers. He was appointed constable, according to the records of the Township of Newark, and his son was the town drummer whose chief duty was to call out residents for Sunday morning worship. Descendant John Johnson actually ran the mill and lived in the adjoining house as the Revolution broke out. Later the mill was converted from flour making into a wool producing factory. 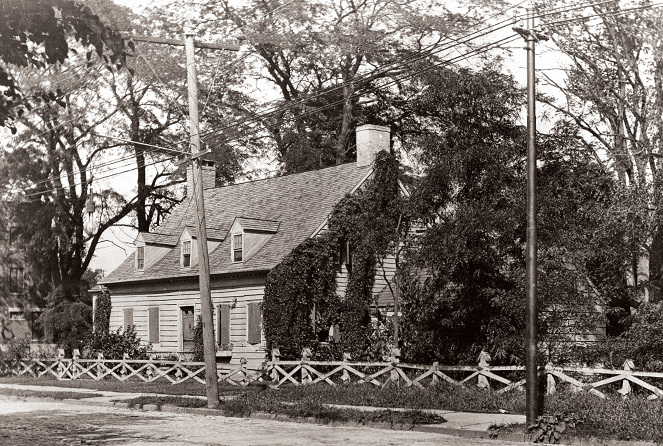 One of the two great homes built in the 18th century, and still surviving today, is the Sydenham-Henderson house, a country farmhouse located in north Newark along today's Branch Brook Park. Its construction date is estimated at 1720. This historic house was built by John and Susannah Sydenham, prosperous north Newark farmers whose address was and is still The Old Road to Bloomfield. Surviving the hostilities of 1776 and enlarged in 1836, the house was lived in until the 1950s by the Sydenhams and Toppings and then by D.J. and Elizabeth Henderson. The stone and wood garrison-blockhouse will eventually become the property of the Newark Museum as a result of the Hendersons' gift and nearly 40 years of restoration by the Hendersons. Today, the shake roof, wooden drains and gutters, rubble stone exterior walls and English country garden are vivid evidence of a long-gone and nearly forgotten agricultural chapter in the history of America's third-oldest city. The Plume House, now the rectory of the Episcopal House of Prayer Church in Newark, was modeled somewhat after the Sydenham House. It also was built on the outskirts of Newark, like the Sydenham House. Today it is surrounded by the city and it is difficult to think of it as once in a rural setting with streets, orchards and an unrestricted view of the Passaic River. Nancy Visscher Plume, who built the home, was of Dutch descent, which is reflected in the building's gambrel roof. Unlike its uptown counterpart, the Plume House is constructed of finely dressed local stone along its Broad Street facade and carries with it the proportions of a finely measured Georgian-style house. Off its central hall are well-proportioned rooms with better-than-average woodwork and wainscotting. The Plume family was staunchly patriotic, and several stories survive of Mistress Plume locking Hessian soldiers in the ice house during the Revolution. The invention of flexible film by the 19th century resident rector, the Rev. Hannibal Goodwin, put the building on the scientific historical map as well. Until 1842, the Plume House was home to that family, but it became the rectory for an Episcopal church in 1849 during the Anglo-Catholic/Oxford Movement of the Diocese of Newark. Over the years there have been improvements to the facility while it has served as rectory. In the 1950s it narrowly escaped demolition with the construction of Route 280 close by. The 11-room building is one of two 18th century Newark houses to survive and be listed on the Historic American Buildings Survey. The exterior was rehabilitated in a state bicentennial project in the 1970s. Two once well-recognized landmark Newark houses, the Nathaniel Camp and Philip Kearny homesteads, built between 1770 and 1780, have disappeared without leaving a trace behind them. However, they were a familiar part of the old Newark scene. The Camp home was built by William Camp about 1770. 'The mansion, conspicuous for its beauty and attractive surroundings, is upon now the corner of Broad and Camp streets (near today's Lincoln Park) and was destroyed in 1856,' according to one report. It was here that Gen. George Washington visited Captain Camp while he was in command of a company of the Essex County Militia. According to one contemporary source, he was supposed to have said, 'I will send a gun tomorrow to complete the equipment of your company, but you must guard it from capture in case the enemy attack in force.' When the equipment arrived it turned out to be a cannon, later called Old Nat, which remained in Newark until it was sent to Washington's headquarters in Morristown in 1879. While Washington was busy tending to military matters with Camp, Mrs. Camp was raiding her meager wartime pantry to produce a suitable meal for their distinguished guest—a meal that included ham and eggs. Who knows what hardships were overcome for even this simple fare when considering wartime conditions?